Photo Credit/ Philly Pretzel Factory DiZio pictured above opened their first Philly Pretzel Factory in 1998 in Mayfair, Philadelphia. ESU alumni and Philly Pretzel Factory co-founders, Dan DiZio and Len Lehman, are bringing hand-twisted heaven to a new location in Stroudsburg. “It’s kind of neat to go back where it all started,” said DiZio. Nineteen states and 175 locations later, many people have questioned why Philly Pretzel Factory didn’t have a store in Stroudsburg, but DiZio emphasized it was a matter of finding the right location and the right partner to work with. Last summer, he was driving home from Great Wolf Lodge, discovered the space at 1619 N. 9th St. and decided to open a corporate store. DiZio estimates the Philly Pretzel Factory’s Stroudsburg location will bring between 10 and 15 jobs to the area, and he will also meet with ESU’s business department to discuss student internship opportunities. DiZio’s entrepreneurial spirit was spawned in middle school. His neighbor owned a pretzel bakery, and one day he asked DiZio to sell the remaining 1000 pretzels after the bakery’s 9 a.m. closing. Eleven-year-old DiZio set up shop on a street corner, sold the pretzels at five per dollar and split the money with his neighbor, earning nine months’ worth of allowance in one day. Within a few weeks, every kid in school wanted a job, and DiZio began recruiting others to sell pretzels after school, on weekends and during the summer. “I was thinking someday maybe I could have a pretzel bakery, never dreaming it could turn out to be this,” DiZio said. ESU Alumni and Co-Founders, Len Lehman (L) and Dan DiZio (R). Though he continued to return home from college to sell pretzels on weekends, DiZio redirected his focus following graduation and became a stockbroker. Trusting the friendship they formed during their ESU days, DiZio and Lehman decided to start Philly Pretzel Factory together. First, they had to overcome the most difficult feat: buying a pretzel machine. After locating a machine, DiZio and Lehman flew to Florida and rented a U-Haul truck to visit the seller. To DiZio and Lehman’s surprise, the pretzel machine was made out of a lawnmower and plywood, and they initially agreed on a $20,000 price. The budding business partners examined the machine for an hour and decided it wasn’t a wise purchase. They got back in the U-Haul truck but stopped 20 yards into their journey. And negotiate they did, from 11 a.m. to after midnight—until they got their deal. When it was time to open their first location in 1998, DiZio and Lehman intended to open at 4 a.m. and close at 9 a.m. like the other pretzel bakeries. Yet instead of renting the typical warehouse for $1,500, they found a location on a busy Northeast Philadelphia street for $1,000. “It turns out it was the best decision we ever made. 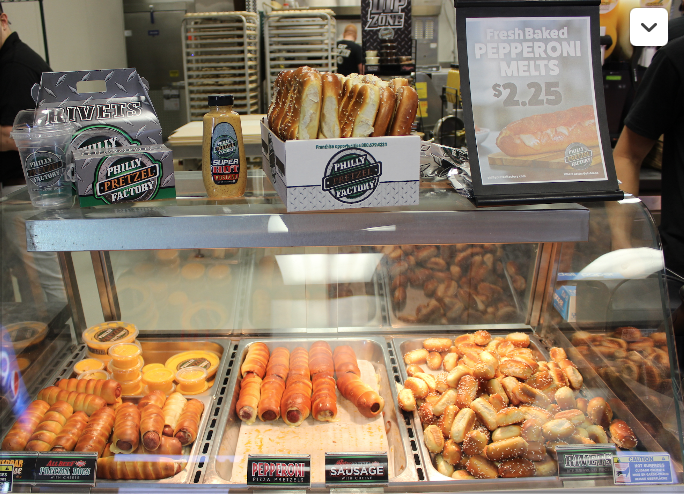 We made it to save $500, but what we didn’t realize was there a huge demand for pretzels,” explained DiZio. At 9 a.m., 50 people were in line, and the foot traffic continued until 5 p.m. From that point on, DiZio and Lehman established Philly Pretzel Factory would be a retail and wholesale pretzel bakery that was open every day, all day. But what makes Philly Pretzel Factory’s authentic German pretzels so desirable? According to DiZio, it’s a special blend of flour. Philly-style pretzels (aka paperclip pretzels) are also connected and baked in sheets, a method early pretzel factories adopted to fulfill large orders. He explained the importance of reinvesting in your company rather than seeking personal gains. As for his personal favorites that every customer should try, DiZio suggests a pretzel hotdog, super-hot mustard, spicy sausage wrapped in pretzel dough and a crispy (not burnt) end pretzel. If you’re eager to sample the menu and enjoy week-long free pretzels, visit Philly Pretzel Factory’s Stroudsburg location at 1619 N. 9th St.